Valves are lanceolate and weakly dorsiventral with slightly convex dorsal and ventral sides. "Shoulders" are lacking. Apices are rostrate in smaller specimens to capitate in larger specimens and deflected slightly ventrally. The axial area is very narrow, barely wider than the raphe. A central area is lacking. The raphe is filiform. Raphe branches are bowed with the convex side of the bow towards the ventral margin. Proximal raphe ends are not or only slightly expanded. Distal raphe ends are hooked ventrally. Striae are radiate, becoming parallel near the apices. Areolae cannot be resolved in LM. 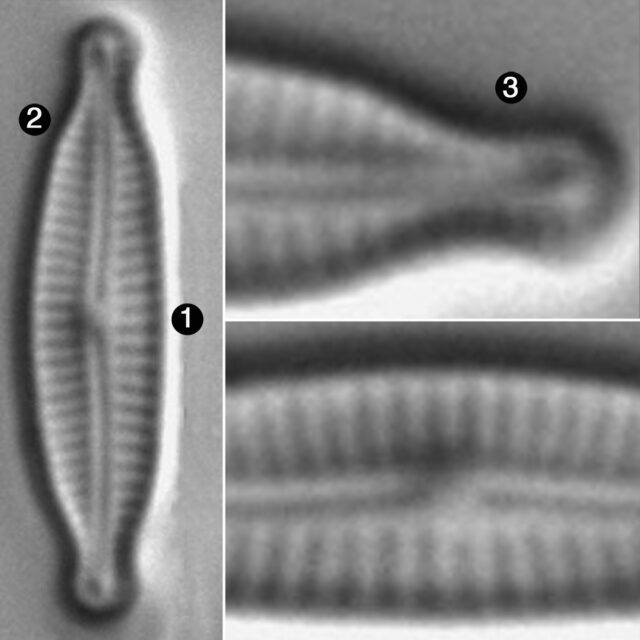 Encyonopsis minuta is widely distributed in temperate and boreal regions (Krammer 1997). The population shown here was collected in East Spring Creek, a small tributary of the Flathead River in northwestern Montana. Encyonopsis minuta is widespread and locally abundant in lakes and spring creeks in the Northern Rockies. Here pH ranged from 8.04 to 9.10 and specific conductance ranged from 93 to 129 µS/cm. In these relatively pristine habitats, E. minuta is often found in association with E. subminuta, but not with the more pollution tolerant E. microcephala. 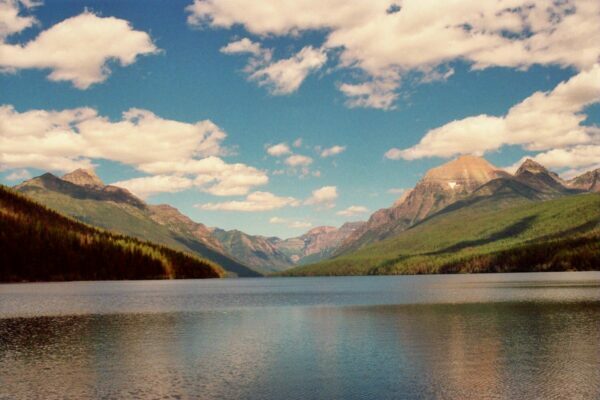 Bowman Lake, Glacier National Park, Montana: home of Encyonopsis minuta. Bahls, L. (2013) Encyonopsis from western North America: 31 species from Alberta, Idaho, Montana, Oregon, South Dakota, and Washington, including 17 species described as new. 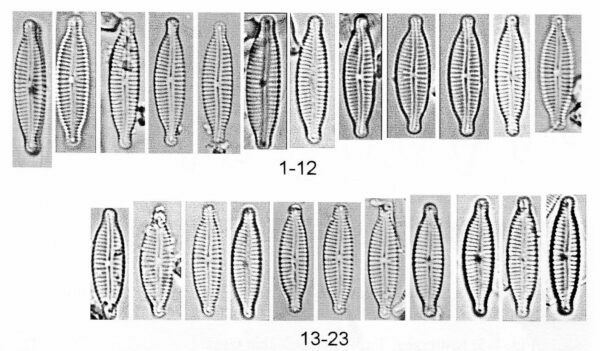 Northwest Diatoms, Volume 5. 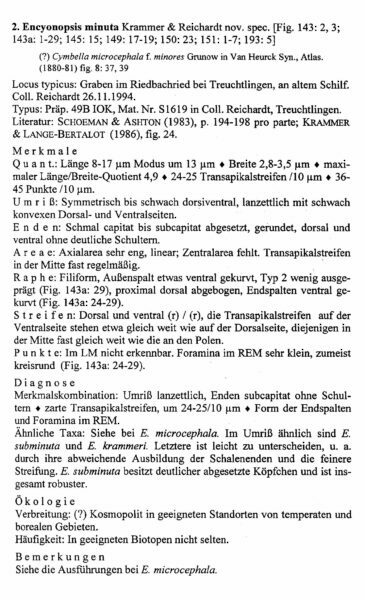 The Montana Diatom Collection, Helena, 46 pp. Valves are weakly dorsiventral, lanceolate and less than 20 µm long. Valves lack distinct "shoulders". Apices are rostrate in small specimens to capitate in larger specimens. Striae number 24-27 in 10 µm.